Jordan Kitt’s was just honored with front row seats at Yamaha’s 125th Anniversary Celebration at Disneyland’s Hyperion Theater in Anaheim, CA. This concert featured performances by, among others, Michael McDonald, Toto, Sarah McLachlan and the Rocket Man himself, seen here with two familiar faces in the background (Jordan Kitt’s President Chris Syllaba center left & CFO Ray Fugere far right). 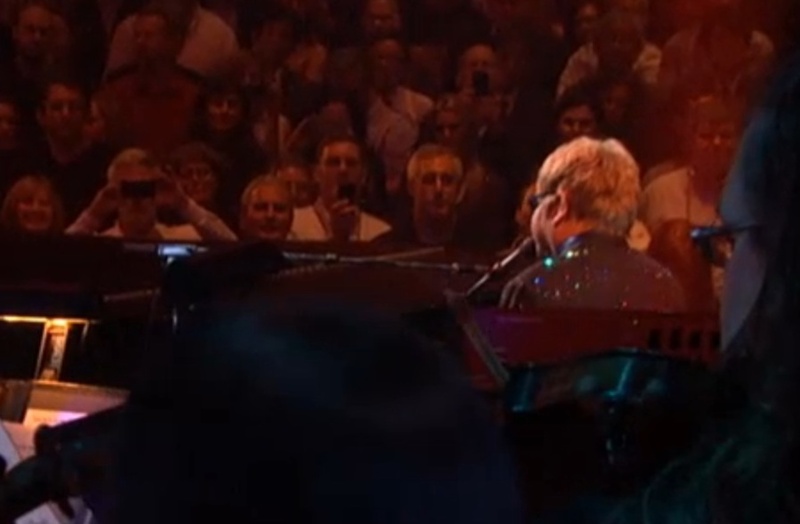 Sir Elton performed on one of his custom Yamaha midi-grands, with his performance being transmitted live, note by note, through numerous Yamaha Disklavier grands in 19 different countries simultaneously! Combined with the 70-piece back-up orchestra transmitted via live video/audio feed, it was the world’s first such performance beamed live around the planet. 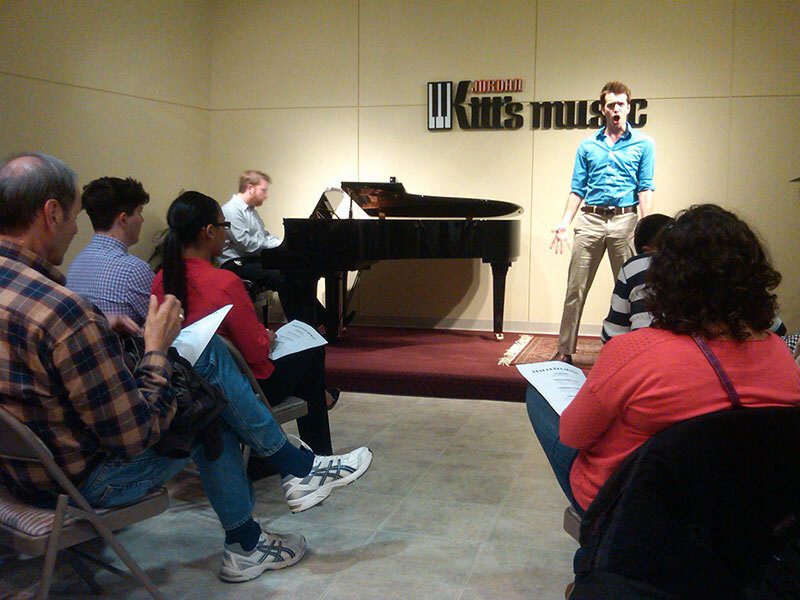 On Saturday evening, January 12 , 2013, at the MSMTA Conference held at the University of Maryland Clarice Smith Center for the Performing Arts, Jordan Kitts Music awarded four MSMTA teachers with the William J. McCormick, Jr. Grants in the amount of $400. The 2013 winners are: Susan Roberts, Linda Kazmarek, Carole Gauthier, and Bok Hwa Kim. 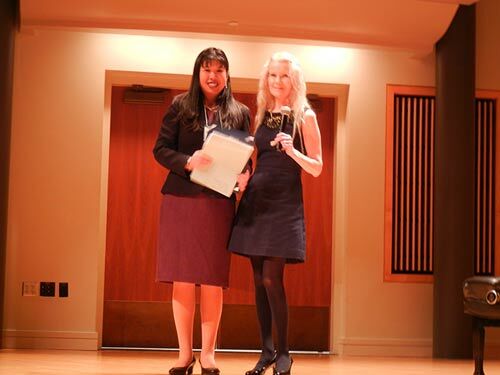 Martha Blakely, NCTM, Artist-in-Residence and Manager of the Jordan Kitts Music School Beltsville, and also a past MSMTA Vice-President, presented the four awards at the MSMTA Gala Concert. William J. McCormick, Jr. began the teacher grant award program more than 23 years ago. Mr. McCormick believed that not only was education an important part of the business of piano sales, but also working with and helping local area teachers. Following in the tradition of William J. McCormick, Jr., co-owners of Jordan Kitts Music, Chris Syllaba and Ray Fugere are continuing the tradition of awarding teacher grants on a yearly basis. 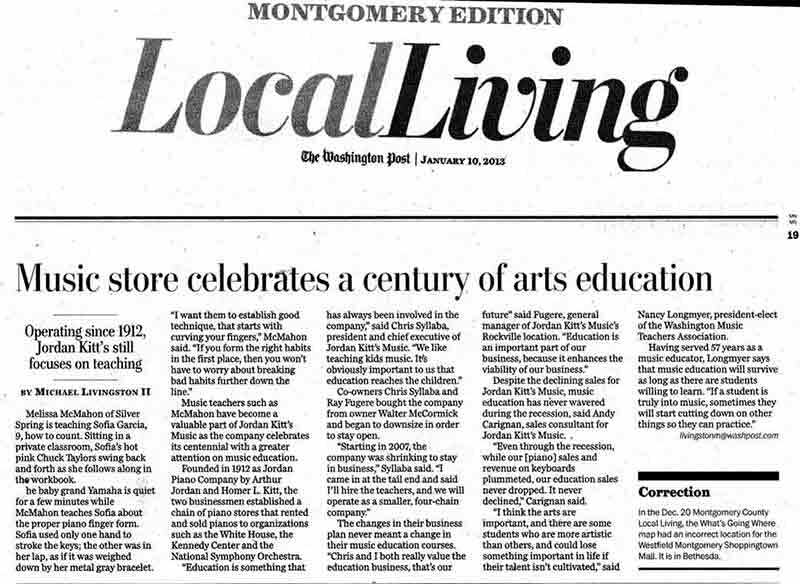 Our Music school was recognized by the Washington Post for celebrating a century of musical arts education! Melissa McMahon of Silver Springs is teaching Sofia Garcia, 9, how to count. Sofia’s hot pink Chuck Taylors swing back and forth as she follows along in the workbook. The baby grand Yamaha piano is quiet for a few minutes while McMahon teaches Sofia about the proper piano finger form. Sofia used only one hand to stroke the keys; the other was in her lap, as if it was weighed down by her metal gray bracelet. Music teachers such as McMahon have become a valuable part of Jordan Kitt’s Music as the company celebrates its centennial with a greater attention on music education. 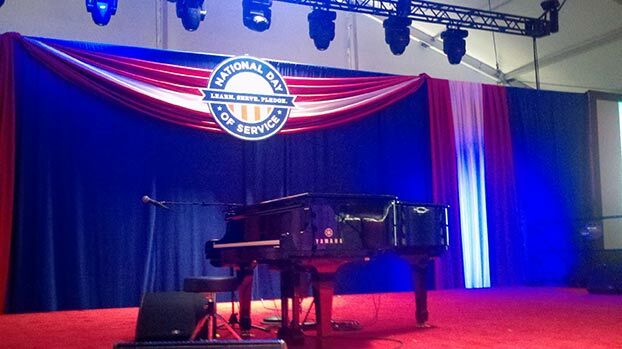 Founded in 1912 as Jordan Piano Company by Arthur Jordan and Homer L. Kitt, the two businessmen established a chain of piano stores that rented and sold pianos to organizations such as the White House, the Kennedy Center, and the National Symphony Orchestra. Olga Boeva is our featured teacher of the month! She heads up the teaching staff at Jordan Kitts Music School in Sterling, located on Route 7 in the Sugarland Crossing shopping center. 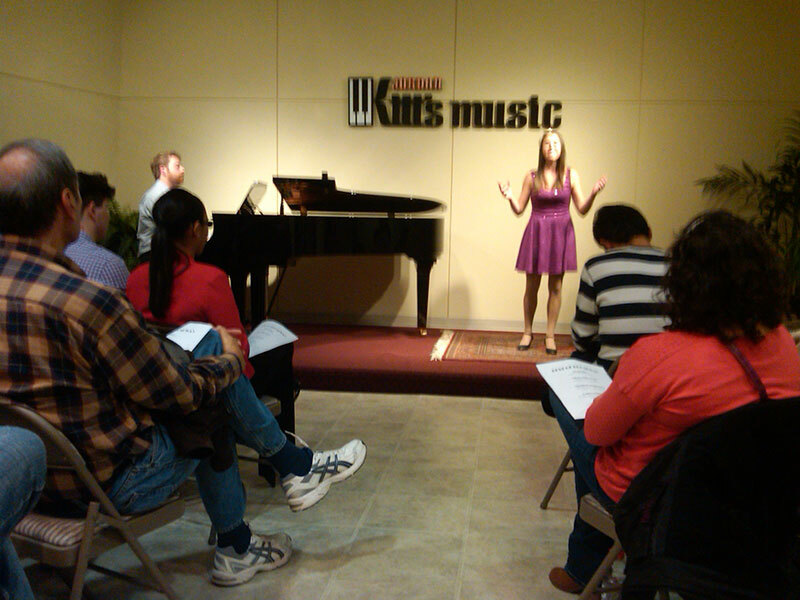 Olga has been teaching full time with Jordan Kitts Music since 2003, offering both group and private lessons. Her studio operates 7 days a week. Her musical training at the University of St. Petersburg in Russia helped develop her broad background in music education. She is able to offer lessons in piano, violin, beginning and intermediate guitar, and will tutor children on the recorder. She is our certified Yamaha teaching specialist at the Sterling location, where she offers Junior Music Course, an incomparable foundation for musical study on any instrument. Four and five year old beginners experience singing, music reading and writing, playing piano, ear training and creating music. 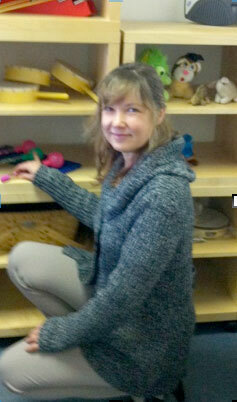 Olga has a remarkable ability to communicate with children and engage them in the learning process. When asked what she loves about teaching, she will say the joy lies in building relationships. 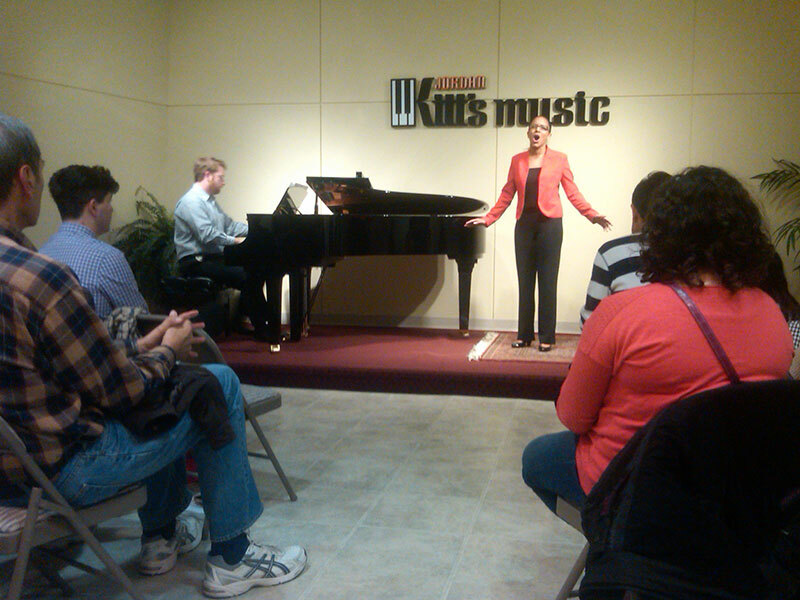 She takes great pleasure in watching young people grow and blossom in their musical abilities. for us for the second year in a row. 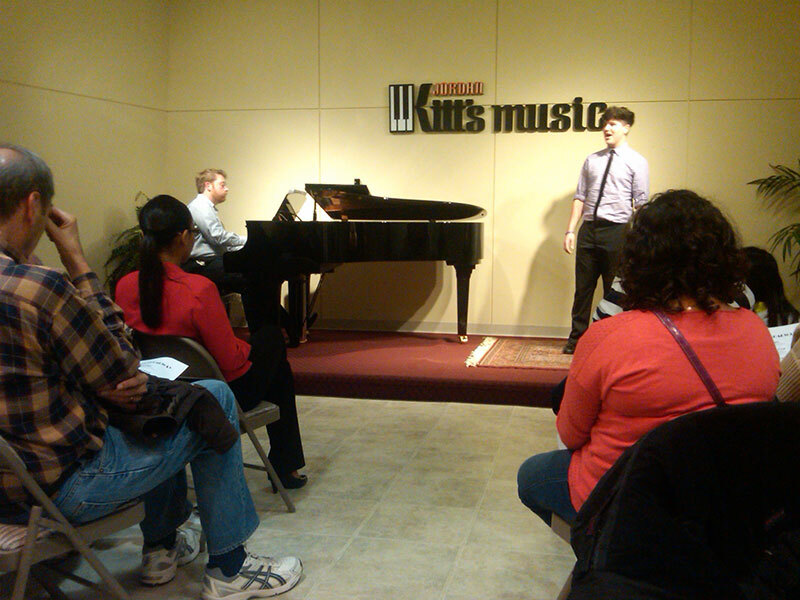 acclaimed Yamaha artist from Columbus, GA.
Have you ever wanted to learn how to play the piano? Is the answer a definite Yes? Well, what if I told you that your piano can teach you how? It’s true! Whether you are a beginner, a hobby player, or a professional composer, the new Roland HPI7F is the perfect fit for you. The world has never seen a piano that can interact with the player on so many levels! First and foremost, the Roland HPI7F Intelligent Piano is the most authentic digital piano music experience. Roland’s Technology (they call it SuperNatural) captures the full expression range of a 9 foot Concert Grand Piano and the touch, tone and feel of the keys makes you feel like you’re performing on a Steinway at Carnegie Hall. It will simply blow you away! 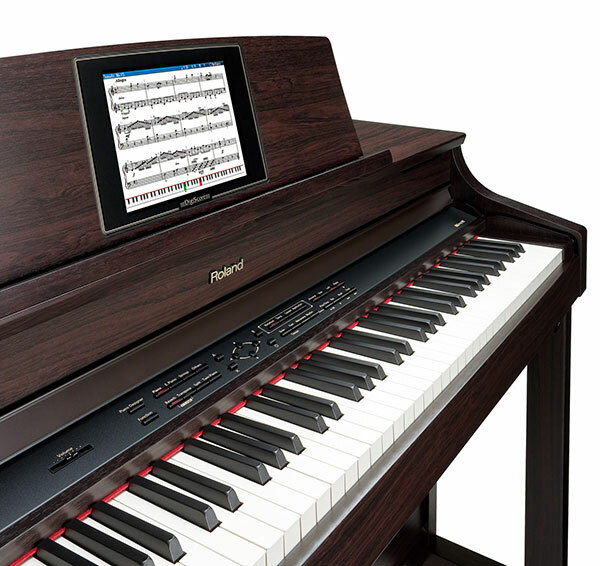 If you are a music reader, you may bring your own sheet music or use the HPI7’s built-in sheet music display, a huge 9 inch screen right on the music rack in front of you. The piano has hundreds of built in songs that you can learn to play or you may download free music from the internet and learn to play virtually any song you like. The Visual Lesson feature will allow you to learn music at your own pace and covers all the stages of education. Like a teacher, it grades your performance and gives you a score. My six year old son has a blast trying to beat his latest high score and improved his rhythm and timing in the process. 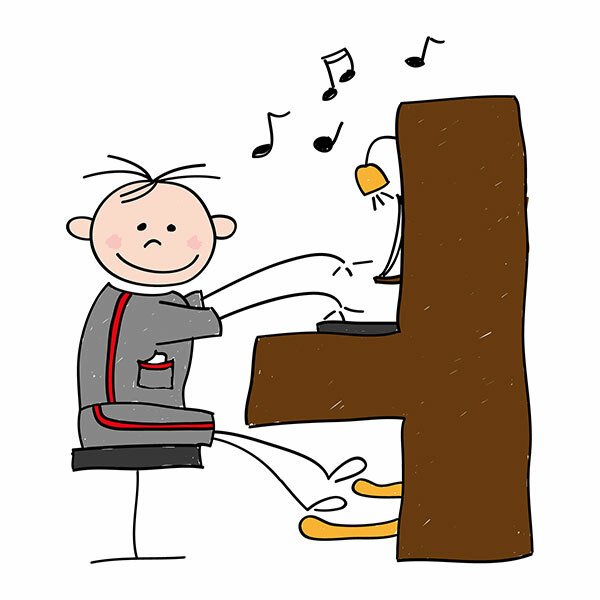 If you have a child that is learning how to play piano, they will love this feature! Roland also takes the redundancy out of practice by including hundreds of instrumental sounds and rhythm options alongside the tick tock metronome. If you are a student that needs to record your practice session, the HPI7F does that. If you are a composer that writes music and records using multi track sequencing, the HPI7F will write your music and give you 16 tracks to score your masterpiece! There is a USB thumb drive to save your work and print your music on any printer, or download new songs from the internet. You can even burn a CD right on the piano and play your performance right in your car or home CD player. family together and creating some incredible memories. When entertaining guests, just put on the automatic music and enjoy hours of uninterrupted splendor. 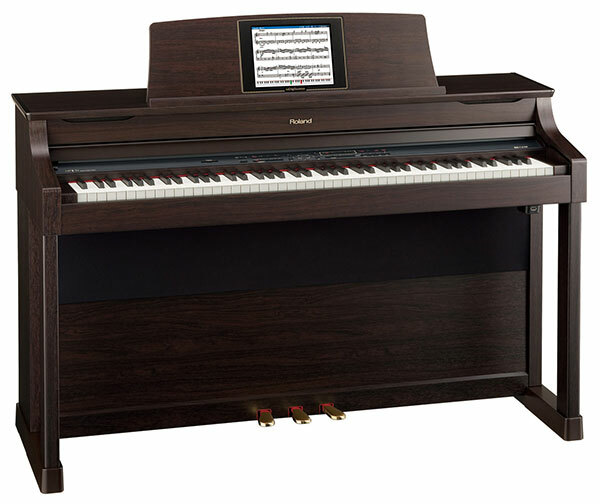 The Roland HPI7F is a unique piano that every piano player and music lover must have. It’s incredible!!! Perform a Google search on “benefits of music education,” and you will find countless explanations of the societal and personal advantages to those students fortunate enough to learn about music in their youth. However, I want to explain to you the top six reasons why I think a music education–specifically learning how to play the piano–should be part of every child’s education beginning at the age of six. 1) Developing Coordination – The child who learns to play the piano is also developing fine motor skills, dexterity, and hand-eye coordination in the process. This has been shown to enhance performance in other areas such as athletics. 2) Increasing Concentration – Participating in a half-hour weekly lesson and practicing every day, a child is intensely focused on the complexities of rhythm, melody, harmony, technique, and theory. This requires spatial reasoning, critical thinking, and creativity, which provide a rigorous mental workout! The increased concentration often results in helping a student to study more effectively, resulting in better grades in school. 3) Building Self-Esteem – There is such a quality as “talent” for playing the piano, but not every child is endowed with this precious gift. However, making the effort to overcome the mental and physical challenges of each new lesson creates feelings of accomplishment and ongoing success, which long-term is building self-esteem. The child who enters middle school years with a strong sense of self-worth fares far better in what can often be a hostile social environment. 4) Acquiring a Well-Rounded Education – More and more, colleges must choose from an applicant pool of academic over-achievers with impressive SAT scores and GPAs over 4.0! What makes one candidate more appealing than another of equal academic success is his/her well-roundedness. Are they involved in their community? Do they play sports? Do they play at least one musical instrument? In addition to the food pyramid steering us to optimal nutrition for our bodies, we must also remember to nourish our souls by feeding our children a healthy dose of the arts every day. 5) Experiencing Future Math/Science Success – This one is a little tough to explain without getting a bit technical–and I am no neuroscientist–but the way I understand it, the grey matter in the brain of a six-year-old child is far more malleable than that of a child who is 16. When spatial reasoning is developed at age six, as happens with the study of music, complex synapses (information transmitters) fire in the brain and forge pathways through the grey matter resulting in “hallways” or “channels” that can be used again later when that child is studying such complex subjects as advanced math and science. If the 16-year-old has no prior pathways forged, the synapses have a more difficult job firing through the grey matter of the brain. 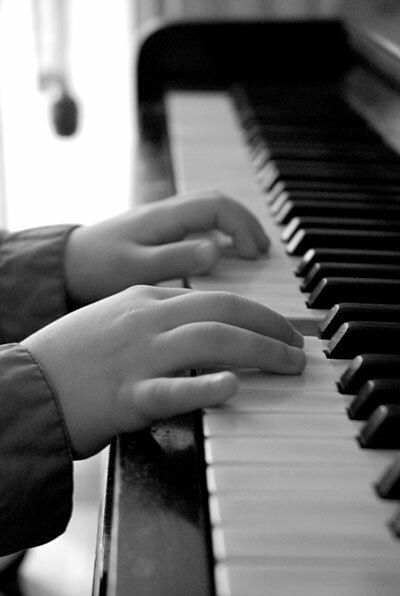 The bottom line as shown by research is that children who learn to play the piano at a young age perform better at high-level math and science later in life. 6) My favorite reason: Producing ENJOYMENT! – It is very important for children to have fun too! It is joyful to make music. The ability to play music fosters a deeper appreciation for listening to music of all kinds. In this age of instant gratification, electronic gadgets, and countless media distractions, it is refreshing to find an activity in which great patience and persistence are required. Playing a keyboard instrument carries forth a Western tradition dating back over 400 years! Your child’s music education can begin with initiating contact today along with the purchase or rental of a fine piano… Allow us to utilize our experience and expertise in pianos sales to also guide you through that process. We hope you’ll provide the gift of music for your child — it’s the gift that lasts a lifetime! It’s not every day that a brand new concert grand is introduced to the market, and without doubt it’s rarer still for an instrument of the quality of the Yamaha CFX to make such an impressive and powerful entrance to the musical world. Yamaha is certainly not new to building fine concert instruments. Since the 1960s Yamaha Concert Grands have been regularly featured in venues, and the CFIIIS has been a stalwart of stages throughout the world since its introduction in 1991. It is the nature of Japanese enterprises continually to develop and improve. 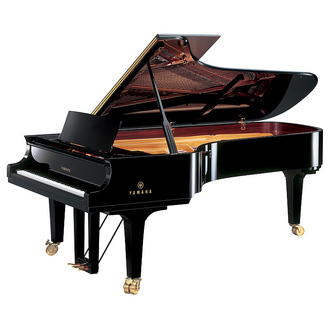 Yamaha is certainly no exception to this, and it has always been the goal of the Yamaha piano company to produce nothing less than the finest concert grand in the world. Indeed, this was the aim of developing and building the CFX. The development of the CFX took many years and was undertaken with extraordinary attention to detail. Yamaha technicians studied the characteristics of the world’s finest handmade pianos, determining what it was that gave each of them their particular quality. They talked to hundreds of the world’s most accomplished pianists, including those that did not play Yamaha pianos, and they asked them all what it was they most wanted to see in a concert instrument, and also what they hoped not to see. They took all this research and distilled it into the design and production of an entirely new instrument. A new factory was built, designed solely for the production of handmade instruments. Little by little, over the past three years, the CFX has started to make its appearance on concert stages and recordings. Everywhere it has gone it has received the highest accolades. 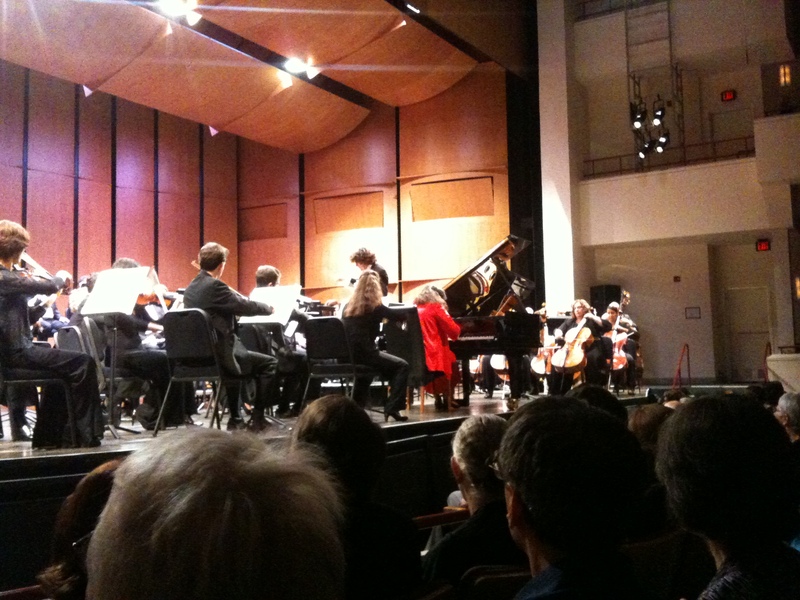 We have presented this instrument at several venues in our market, most recently when the piano was featured at a concert presented at the Schlesinger Center in Alexandra when Yuliya Gorenman performed Brahms’ First Piano Concerto with the Alexandria Symphony Orchestra (picture attached). The reaction of both performer and audience was extremely positive. This is not surprising: the CFX is unlike any other piano. The action is exquisitely balanced, and it is incredibly easy to play. The dynamic range is astounding and it is possible to navigate from thundering bass notes to the most delicate highs with ease. The power of the instrument is impressive, and the depth of the sound, even at low dynamics, is amazing. If you get a chance to hear or play the CFX, I urge you to take it. You will not be disappointed!